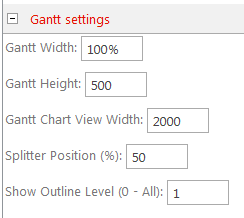 Gantt settings include appearance settings (width, height, Gantt chart view width, splitter position, default timescale, colors and etc). You can define width of Gantt chart horizontally scrollable view. Default value: 2000. Minimum value: 1024. Maximum value: 5120. 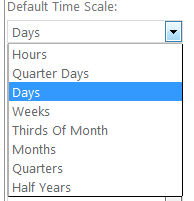 Define default timescale and scroll to task mode (middle of the view or begin of the view). Paging mode is supported in the Resource Management web part. This feature allows to configuring page size when you click the previous or next page button. You can apply full page mode or half page mode. If you use “Full Page” mode, when you click next or previous page, you will go to the next period of time. For example, if you see “May 2015 – July 2015 –August 2015” and click “Next” in full page mode, you will move to “August 2015 – September 2015 – November 2015”. And if you use “Half Page” mode and click “Next” from the same page, you will move to a half of next period. From “May 2015 – July 2015 – August 2015” you will go to “July 2015 – August 2015 – September 2015”. 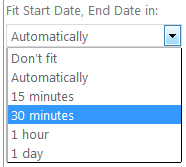 It is allowed to use “Fit Start Date, End Date in N minutes” web-part property in case you want to define the step for start/end date changing. 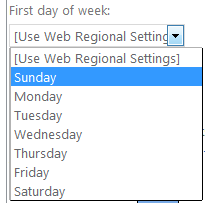 Then define first day of week and first week of year to show. 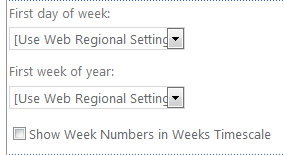 Check the box “Show week numbers” if you need to show them. You can check the box “Gradient color” or leave it unchecked. Then define threshold levels (amount of tasks planned for a single period of time) – yellow and red levels. Click “OK” when you define all the settings or “Apply” to save the settings and continue adjustment.